Click here to get the full newsletter. Note: Featured articles posted online will give you specifically what you want, but much is missed if not reading the PDF Newsletter. Not all content is posted here. Although online membership rolled out to other jurisdictions in the past 2 years, Maine went “live” on Monday, 25 June. Lead with Faith: Knights are committed to daily prayer, weekly Mass, and building a community of faith. This is the Knights of Columbus difference, knowing that you are backed by a band of brothers in the quest to become better Catholic men. Your membership gives you access to faith-building materials that will help you draw closer to God and lead with faith. Protect your Family: As a Catholic man, you have a responsibility to protect and provide for your loved ones. 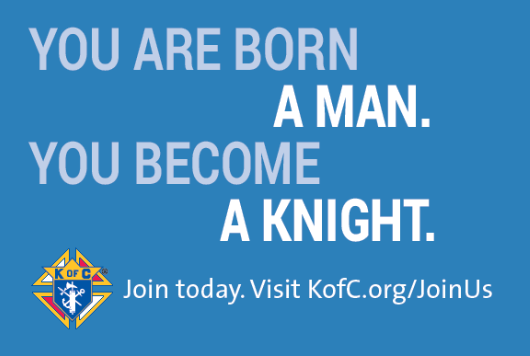 As a member of the Knights of Columbus, you have access to exclusive resources to help you do just that. Our top-quality financial products, backed by our ethical and Catholic business practices, can help you secure your family’s future and give you peace of mind. Serve Others: You seek to give something of yourself in service. The Knights of Columbus unites us in charity so that each effort and donation counts for the greater good. While charity begins in your home, through the worldwide network of Knights, your reach extends to those in need around the globe, from earthquake victims, to AIDS orphans, to ISIS victims in the Middle East.